The answer to this is based on the complexity of the machine. If the machine has several interconnectivities to other processes, then it will be a wise decision to carry out an inspection. False. 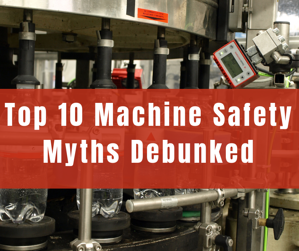 All companies, irrespective of their size are legally required to carry out safeguarding of their machines, and to ensure their workers are out of harm’s way. The only thing that a company’s size determines is the amount of fine it is charged for non-compliance with safety regulations. In addition, when a machine is ordered from an OEM, it may come certified with certain standards. This doesn’t eliminate the need for re-inspection as in case of any untoward incident, the client company will be held responsible for litigations rather than the OEM. Accidents that may occur due to lack of safeguarding can lead to inspections. If non-compliance is found to be the cause of these accidents, in addition to fines, individuals can be held responsible as well. Several countries have made necessary amendments in existing laws to widen their scope. For instance, in Canada, violations that result in injuries or death are treated as criminal cases. This means that in addition to the company paying hefty fines and compensation costs, the executives-in-charge can be held personally responsible. This can ultimately result in prison time for the executive’s inability to protect the safety of workers. This is not true as movable guards intended for safeguarding must be interlocked to provide a signal to the apparatus. Fixed guards must have ample protection, secured through fasteners or permanently (welding), to make tampering impossible. The gate must be interlocked since the guards must never be closed without their fasteners. The final myth, and the most outrageous one. In the short-term, investment in safety mechanism may sting the company’s finances but the benefits are reaped in the long run. Worker safety can be guaranteed, immediately cutting down compensation costs and legal fines. Furthermore, safeguarding boosts workplace morale while employees can focus fully on getting the job done, rather than worrying about their own lives. There’s a common argument that safeguarding can adversely impact efficiency by limiting the dimensions of physically accessible work space. This can be tackled by introducing automation or robotics for certain manual tasks that involve too much complexities, completely cordoning off the respective area. An example of effective safety design would be the incorporation of an array of safety laser scanners in areas where collaborative robots are being used. If a worker inadvertently enters the robot’s area of operation, instead of being shut-down, the speed of motion is reduced to a predefined operating level. This intrusion is displayed through indication lights. When the employee moves out of the designated area, the robot’s performance level parameters (motor speed) are increased.